While the weather outside was the color of the first thread – cold and gray and pelting rain – my internal weather was much more like the rest of the threads and even the fabrics. I used to care fiercely about fiber content in the threads I used, I think as a hold-over from caring about the threads I wear (small joke). I was a natural fiber snob. Except Coast and Clark have come out with some truly gorgeous polyester thread and I am smitten. And won over. They are smooth and pretty, and really that is all I care about when I'm stitching with them. 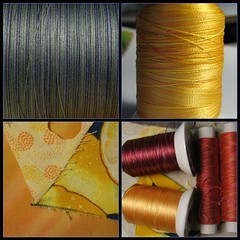 So, my thread palette has grown over the last year with new reels of shiny thread. It makes me verry happy. I must mention the hand dyes I've been using for a lot of the outdoor colors too. They come from Cindy Lioselle, who still has no online presence that I am aware of (Cindy! What gives?!) Cindy is a talented dyer whose dedication to color in general and getting a particular color is amazing. She kindly handed me a pile of scraps (they are HUGE scraps for me) I was drooling over last fall, and I have been mining the pile for lovely muted colors for a while. hey, lee, send me your email and i’ll send you a card! if i have yours, i can’t find it!